Okay I haven’t finished my remake of Joust yet, nor did I want to wait until the last week of the month to get an article out. Instead, I offer you Monster Maker as June’s monthly program. It’s pretty straight forward and anti-climatic against the power of today’s programs. Once you load it, enter in five numbers and type your monster’s name. That’s it. 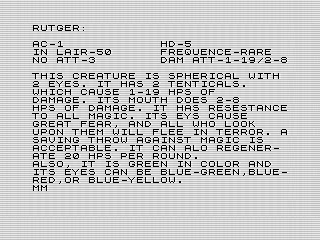 The program will then display a nicely formatted monster description based on your input. If you couldn’t tell, I wrote Monster Maker during my D&D days. I fancied myself a DM (dungeon master) and spent a lot of time drafting out maps, writing campaigns, and creating new monsters. It shouldn’t be surprising that my work often spilled into my programming. Unfortunately, this attempt wasn’t very advanced. The monster created is pretty static and running it more than once yields minor changes. Monster Maker is actually a ZX81 version of a program I drafted for the schools’ computer. I hadn’t learned random numbers or flow control yet when I first penned it so the program is pretty basic. It uses mostly INPUT and PRINT commands to gather information and display it back in a nice format. I think I had meant the display to be printed. When I moved it I added a few ZX81 specific commands like PAUSE and AT. I even used some functions like ABS to remove the sign should a negative number be returned. I also used DIM to create a number array, a common function even on old computers. There are a lot of good programming concepts here, just not enough. If this had been an exercise, by the way it wasn’t, I could have presented a few more challenges to the programmer as he or she learned more BASIC commands. Here are some of my ideas should you wish to attempt them. Eliminated the need to input numbers. Using flow controls, change the shape and color of the monster. I’m sure you can think of a few more ways to make this program even more interesting. You could even attempt to use this monster generation routine in a battle game. See, even a simple program can be a jumping point for something bigger. My programs, fortunately, did get better and much more interesting. However, visiting these old programs remind me of the wonder I had when I first learned about computers. 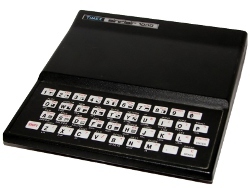 But even a computer as simple as the ZX81 can do some pretty amazing things. As archaic as these programs may seem, they have the roots of many of the amazing programs you use today. Monster Maker was a root for me, one that grew into a life long career.